When it comes to buying a web hosting plan, you have several payment options to pay. Almost all of the web hosting companies accept credit card. But not all of them accept PayPal. It’s a big problem if you don’t have an international credit card or you don’t want to pay with credit card. Luckily, some of the best web hosts accept PayPal payment. If you want to buy domain and web hosting with PayPal, read on. In this post, I’ll be sharing a list of web hosts that accept PayPal in 2018. Before going to the details, check the list first. HostGator $3.95 Easy Control Panel. A2 Hosting $3.92 20X Faster Servers. eHost $2.75 Free Domain Name. Drag & Drop Site Builder. A Small Orange $5.00 99.9% Uptime. Now let’s see the details of the web hosts with PayPal payment option. Bluehost is powering 2 million websites worldwide. With the official WordPress recommendation, it’s considered as one of the best web hosting companies all over the world. It offers free domain name, free site builders, 1-click WordPress install, 24/7 support and many more. You can host your site as low as $3.45 per month. Bluehost accepts Paypal payment. But it hides Paypal payment options. I don’t have any idea why they hide it. Once you are on the “payment information” section, click on “More payment options”. Then scroll a little bit and you will find an option “Pay with PayPal” under package information section. Just select the option and pay your hosting bill with PayPal. HostGator is one of the most popular web hosts. It has been in hosting business since 2002. Over the time, it has become very popular for its shared hosting. HostGator offers Easy Control Panel, 1-Click Scripts Installs, Money Back Guarantee, Technical Support, etc. You can get started with HostGator for just $0.01. HostGator lets you pay with PayPal. Once you are on the “Enter Your Billing Info” section while signing up for HostGator, select “PayPal”. After clicking on the checkout button, you will be landed to the PayPal payment page. A2 Hosting provides blazing fast web hosting solution. Its turbo servers will make your site 20X faster. It is also optimized for security. A2 Hosting offers Faster Hositng, Unlimited Resources, 99.9% Uptime, Live Chat, Free Account Migration, etc. You can pay your hosting bill with PayPal. Once you are on Shopping Cart page, select PayPal from “Payment Details” section. Then complete your payment with Paypal. eHost provides affordable web hosting solution with a free domain name. You can host your site on eHost as low as $2.75/mo. It also offers Drag & Drop Site Builder, Free Email Address, Free Marketing Tools, etc. It has already hosted 1 million websites. You can pay your hosting bill via PayPal. Just select PayPal on your Billing Information. A Small Orange was founded in Atlanta. With over 10 years experience in web hosting, it has become popular for its quality hositing with affordable price. It offer Free Site Building Tools, One Click WordPress Install, Free Shopping Cart Software, Unlimited Domains and Emails, and many more. You can buy a domain and hosting plan from A Small Orange with PayPal. Just select “PayPal” tab from “Enter Your Billing Information” section. You will be asked for your PayPal information on ordering page. Site5 Web Hosting is designed for web developers and designers. It offers Unmetered Bandwidth, Unmetered Disk Space, FREE Migrations, Backups, and 24*7 Support. You can buy hosting from Site5 on a month to month basis or yearly. It also offers 45 days money back guarantee. Site5 allows you to pay your hosting bill with PayPal. Just select “PayPal” option from Shopping Cart Page. Arvixe provides quality web hosting since 2003. It offers Free Site Builder, Free Online Store, Easy Control Panel, Live Support, etc. Another amazing feature is, it offes a free domain for life. You can host your site on Arvixe as low as $4/month. Arvixe accepts PayPal payment. 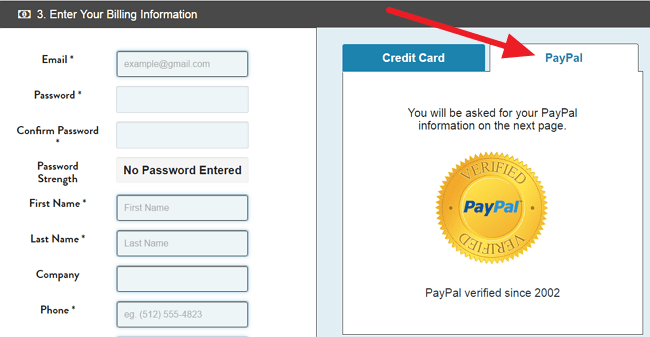 While you are on the “Arvixe Order Form” page, select PayPal tab form Billing Information section. iPage is the best budget hosting company. It lets you host your site as low as $1.99 per month. If offers Free Domain Registration, Free Site Building Tools, Free Online Store, Money Back Guarantee and more. iPage allows you to pay via PayPal. Just select PayPal from “Payment Information”. JustHost offers affordable web hosting with Free Domain, Free Site Builders, 24/7 Support, and 1-Click WordPress Install. You can get started with JustHost for just $3.95 per month. It also offers $200 free advertising credits for your site. You can pay your hosting bill via PayPal. All you need to do is, select “Pay with PayPal” from Payment Information. HostMonster is a profession web hosting service that has been in business since 1996. It offers Free Domain, Instant Setup, Free Site Builders, 24/7 Support, etc. You can get started with HostMonster at $4.95 per month. HostMonster accepts PayPal payment. But it hides the PayPal payment options. You need to click on “More payment options” to get the “Pay with PayPal” option. So these are web hosting companies that accept PayPal payment method. All of these hosts are renown and have been in business for years. You can trust them. I’ve personally used both HostGator and Bluehost. Both are good. For shared hosting, I recommend Bluehost. Do let us know which hosting you are going to use. If you have any question regarding any host, let us know via comment.